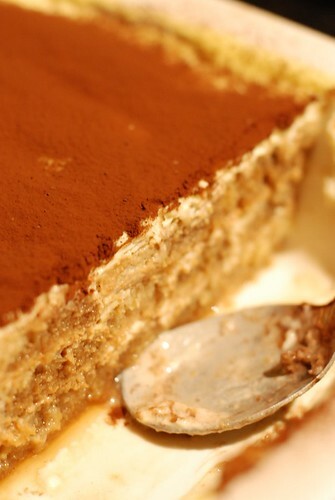 This recipe is probably from a lovely little Italian grandmother who not only makes the best tiramisu, but also the greatest pastas and tomato sauces. However, the live demonstration in my kitchen was done by an Italian man in his twenties. Nonetheless, I can guarantee that the recipe originated from a rustic kitchen in Italy, because this man eyed me with suspicion as I laid out my colourful measuring spoons, and was fascinated with my KitchenAid’s ability to improve his efficiency tenfold. It was super refreshing to have someone else take control of my kitchen to show me something new. Not only did I get a chance to scribble furiously on my notepad, but I was also able to click away on my camera freely to get some action shots of the process. After chasing this man with “how many spoonfuls of sugar?” and “can you please throw that into this lovely measuring spoon before dumping it in the bowl?”, I think I might have a recipe for you. Try it, and let me know what you think! In an electric mixer with the wire whisk attachment, whip the egg yolks and 2 tbsp of the sugar together until it’s light butter yellow. This should take about 5-8 minutes, and can be done at medium-high speed. Meanwhile, whip the egg whites and salt together in a separate bowl, using an electric handheld mixer, until soft peaks form. Add 1/3 of the carton of mascarpone cheese to the egg yolks mixture and continue to whip for about 3 minutes on medium-high speed. Then add in 2 tbsp of sugar and whip for about 3 minutes. Repeat this step. You should finish with the last 1/3 of carton of cheese. Incorporate about 1/2 of the egg white mixture into the egg yolks and beat for 3 minutes on medium-high. Then add in about 2 tbsp of egg yolks at a time, whipping for about 10-15 seconds between each addition, until all of the remainder of the egg whites have been added. Once everything’s been added, taste the mixture to make sure it’s lightly sweetened, but not too sweet. You can adjust at this point if you think you need more sugar, but we found that at 6 tbsps, it was just about right. 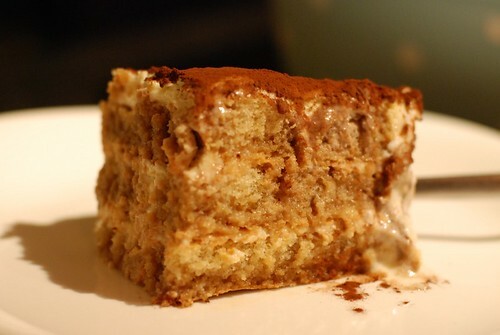 Tiramisu isn’t meant to be a super sweet and dense dessert! Whip for another 2 minutes on medium high. 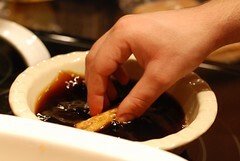 Dip the cookies quickly in a shallow pan full of coffee, and then arrange on a dish. Usually the Pyrex glass ones would work well. 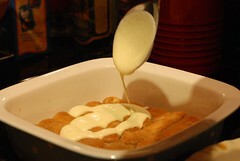 Drizzle the tiramisu cheese mixture over your layer of cookies lightly just until a thin layer covers the cookies evenly. 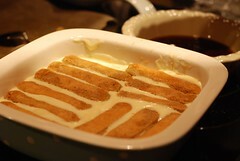 Repeat until you get to the top of the pan, and finish off with the layer of tiramisu cheese. 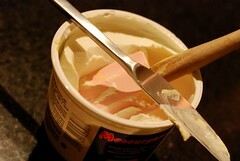 Refrigerate for at least 12 hours prior to eating. Just before serving, dust some cocoa powder on top and if you’re feeling really decadent, maybe also some chocolate shavings. Love the recipes, keep them coming! I just started my blog as well.